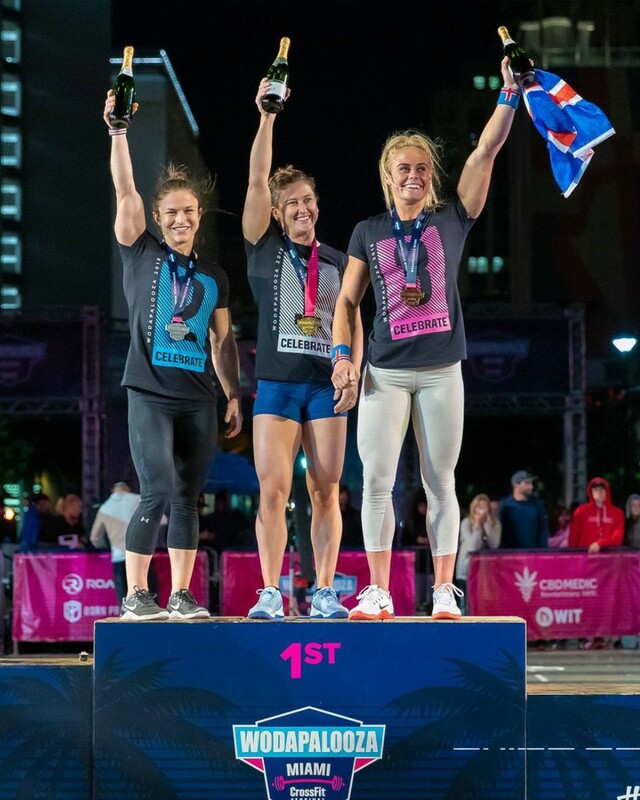 As if it was ever in any doubt, Tia-Clair Toomey dominated from day one in Miami at Wodapalooza to secure an early invitation to the 2019 CrossFit Games – and frankly it’s hard to see anyone stopping her there, either. Just like Mat Fraser at the Dubai CrossFit Championship in December, two-time defending “Fittest on Earth” Toomey was the clear favourite going into last weekend’s “Sanctional” qualifying event and did not disappoint. “Now it’s back to the drawing board to see what’s next. @mathewfras ?? ?” the Australian wrote in an Instagram post after her victory. Indeed, the two reigning champions can now put their feet up and tailor their entire seasons to focusing on Madison, Wisconsin in August. Instead of having to grind his way to another victory in Miami, Fraser was relaxing with a headset on at the announcers’ booth, where he will have got a first-hand look at Wodapalooza men’s winner Patrick Vellner. The Canadian was runner-up to three-time champion Fraser last summer at the Games, having finished third in 2016 and 2017 – and he’ll know exactly how his rival is shaping up form-wise. He will have also seen Toomey blow the competition away – she finished in the top two in all seven events over the three days, with a victory in the final workout to underline her status as the top dog. Toomey is aiming for history this summer when she will look to become the first woman to be crowned Fittest on Earth three times. Iceland’s Katrin Davidsdottir and Annie Thorisdottir have also won gold at the Games twice since its inception in 2007, and will try to have their say. But Thorisdottir has only made it to the podium once since her last victory in 2012, when finished third in 2017. The 29-year-old also dropped out of Dubai following heart arrhythmia surgery, after the issue troubled her at the 2018 Games. And Davidsdottir, 25, has had to settle for fifth place and bronze in the last two editions following her back-to-back wins in 2015 and 2016. Laura Horvath was runner-up to Toomey last summer, finishing 64 points behind her, but the Hungarian pulled out in Dubai with a worrying back injury that could trouble her preparations for the Games. Samantha Briggs, the 2013 Games champion, showed age is just a number by securing her return to elite individual women’s competition at 36 with victory in Dubai at Horvath’s expense. The Briton had competed in the 35-39 age group last summer, finishing second, but could pose Toomey her greatest threat, especially since she can also now focus solely on the Games. But it’s the standards being set by Toomey that the rest will have to match – she picked up exactly where she left off in Madison, and that should be a frightening thought for all of the pretenders to her throne. For now, she can just continue the celebrations. “Thank you from the bottom of our hearts to everyone that made @thewodapalooza possible,” Toomey added on Instagram after her win. “From the volunteers, judges and spectators to all the athletes, event organisers and sponsors.